If you hadn’t seen this yet, you’re welcome. It premiered last night on Jimmy Fallon and is probably one of the deepest songs I’ve ever heard… about gaming. Brought a little tear to the eye of my Belf Warlock. I love that I recognize so many folks in that video from the WoW community and the Geekery community at large. Felicia Day, Chris Hardwick, Chloe Dykstra, and a few folks from the Frogpants forums as well. Y’all make my life. Kickstarter! OVA: The Anime Role-Playing Game by Clay Gardner! This much-awaited (much, much, MUCH awaited) Kickstarter project is the brain child of my friend Clay Gardner (with gorgeous illustration work by Niko Geyer) and pretty much SHATTERED its goal within hours – JUST hours. It’s called OVA: The Anime Role-Playing Game and I am so excited to start playing this game. 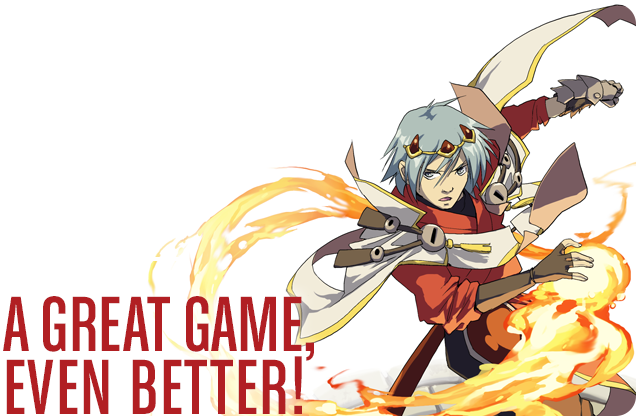 I love anime, and I love tabletop RPGs, so I feel like this was made for me. And it seems, a lot of people feel the same way. The original goal was $7,500 but at the moment of writing this, they’re sitting pretty at $90,728. Holy crap, right? Clay was sweet enough to take a moment of his time and answer a few questions about his awesome Kickstarter campaign. I figure the man behind the project would be able to tell you a little more about it than I can. So let’s start! 01. Tell us a little about your Kickstarter. Where did the idea for it come from and who is all working on it? I wrote the beginnings of OVA around ten years ago. I was just getting into anime heavily, and I wanted to represent the shows I was enjoying in role-playing form. But at the time, I felt constrained by most games available. Many great and fun systems existed, of course, but nothing seemed to let me create the character I wanted to. Even point-buy systems, which on paper were supposed to open up possibilities, always seemed to punish making cinematic decisions. Having a character good with both a gun and martial arts had very little to do with a character’s effectiveness in the game, but almost always resulted in a crippling reduction in available points. And so too with multiple flashy attacks, or really anything done for the sake of “being cool.” I wanted a game that embraced doing things for the fun of it, and soon, OVA took shape. I released it as a PDF in 2005, with a print run following the next year. 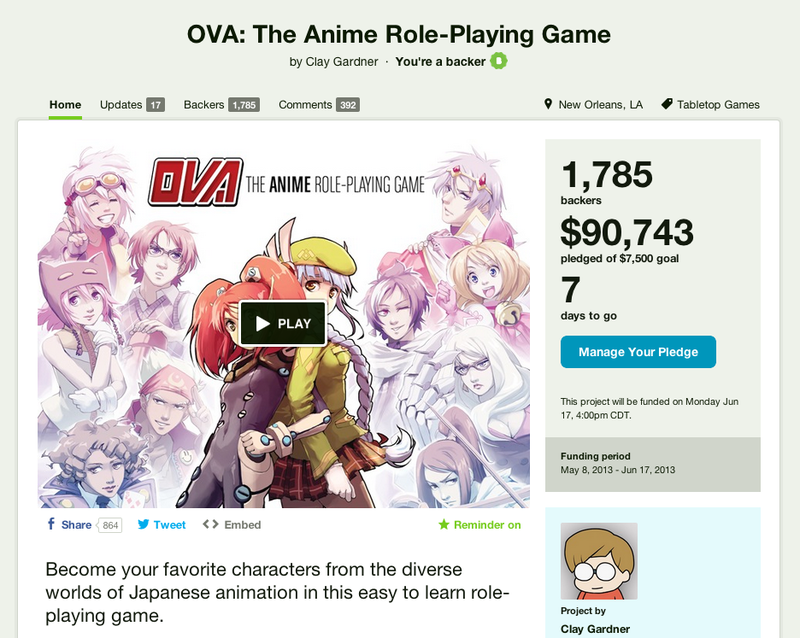 This Kickstarter is for a new, revised version of OVA. The game holds onto the same ideals I had a decade ago but is improved with all the experience I’ve gained in the time between. A brand new layout, art done by a single talented artist Niko Geyer, and many refinements and expansions to the rules make the game better than ever before. It’s OVA as I knew it always could be. 02. What was the hardest part about putting together a campaign like this? I hope it’s not too much of a cop-out answer, but I feel like getting the whole thing together was the hardest part! By itself, each element was a lot of work, but being able to juggle creating a video, the page graphics, all the groundwork for promoting the kickstarter, and all the text the project required at the same time…well…I’m glad it’s all done! 03. What has the process been like getting OVA: The Anime Role-Playing Game together? What came first – stories, characters, worlds, etc? How do you keep it all organized? Because OVA already existed in some form, working on the new edition sort of jumped between everything in no particular order. I’d spend some time creating a new character, who’d inspire a new rule or revision. Or maybe a new rule would change the way I thought a character should be written. But I think it was always about characters at heart. That is why we play role-playing games, after all, and I wanted to make sure that every part of the new OVA was dedicated to making the process of realizing a character as simple and fun as possible. As for how I keep it all organized, I tend to jot down all my ideas in text files before introducing it into the actual manuscript. After I had the manuscript more or less complete, I began typesetting the book while making small revisions I felt were appropriate. I guess you could look at each file type like a different draft, with the actual InDesign layout file being my last pass for the text. 04. What advice do you have for others who are thinking about starting their own RPGs or Kickstarters? Take the time to make your page look as good as possible. While a solid idea will get support based on its own merit, a professional presentation instills confidence in a project and shows that you’re the kind of creator that is serious about bringing a product to completion. Show finished, polished examples of your work in action, and if possible, make graphics that spell out exactly what each of your pledge levels offers. If you’re kickstarting a game (be it an RPG, a board game, or even a video game) give visitors a way to try it out. Whether you offer a print-in play version, a condensed copy of the rulebook, or just a demo, people appreciate being able to know what they’re getting and not just acting upon a sales pitch. 05. And finally! If you were to sit down at a table to start playing OVA, who would be your ideal/dream RPers to play with? Can be anyone, living or dead. Who would they play? That’s a tough one! If we expand the “anyone living or dead” magic to include breaking language barriers, I think it would be fascinating to play the game with Japanese story-telling greats like Hayao Miyazaki and Osamu Tezuka. And of course Ryo Mizuno of Record of Lodoss War fame. I wonder how he’d feel about OVA’s rules in comparison to systems like D&D and Sword World that formed the basis of so many of his stories? What characters would they play? Ones from their own tales? New ones whole-cloth? Hard to say…but it would be kind of magical if one of them took up the Game Master’s hat instead! Right now, the goal is to hit $100k and I fully believe they can do! Let’s help get them there – if they get there, a new reward will open up, and I would love to get my hands on it. So what are you waiting for? Go kickstart this project! I have Chris Rickert, ringmaster behind the Midnight Carnival troupe of volunteers for The Last Unicorn tour (you’ll be hearing more about this shortly), to thank for introducing me to this awesome Kickstarter. I can’t believe I hadn’t seen it before or it hadn’t somehow come across my radar considering the names involved with this project, but I’m so glad I got to be involved before it was over. After I pledged, I got a note from Daniela Di Mase, one of the producers of the movie, asking if I’d like to write about it on my blog. Of course I jumped on the chance and here we are. So without further ado: Blood Kiss. “There’s nothing supernatural about vampires. My vampires, that is. In blood kiss, everything’s explained in terms of a symbiotic micro-organism that alters the vamps’ mitochondrial DNA. It renders them allergic to sunlight and silver, but they can still be reflected in mirrors and have no particular aversion to the cross. (Some might even believe in god.) They’re much stronger and faster than humans, and practically immortal to boot. In terms of story, there’s something very seminal about the way it unfolds. Without going into specifics, I think I can safely say that it hits all the tropes of both the detective genre and the vampire genre, and does so in a very organic way. You want to bring people to the movie’s end with the feeling that it couldn’t have ended any oher way, that the ending’s inevitability is highly satisfying, and yet they didn’t see it coming. If you can do that, you’ve created gold.” – Michael Reaves. That pretty much sells it for me. But if you need a bit more: Michael Reaves, who has written for Batman: The Animated Series, Gargoyles, The Twilight Zone, Star Trek: TNG, and so much more, is the mastermind behind this project and has pulled in quite a few of his talented friends, including Neil Gaiman (yes! ), Amber Benson, and Tom Mandrake. Blood Kiss is described as classic film noir with a twist: vampires. Honestly, I feel like I should stop there because I don’t know what else to say that would make you want to go – the story sounds genius and the list of folks taking part in this is enough for most people to cough up whatever they have in their wallets. You still have 7 days to do so too! Check out the Kickstarter page and make your pledge while you still have time. There are some excellent pledge levels and incentives to give. What are you waiting for? 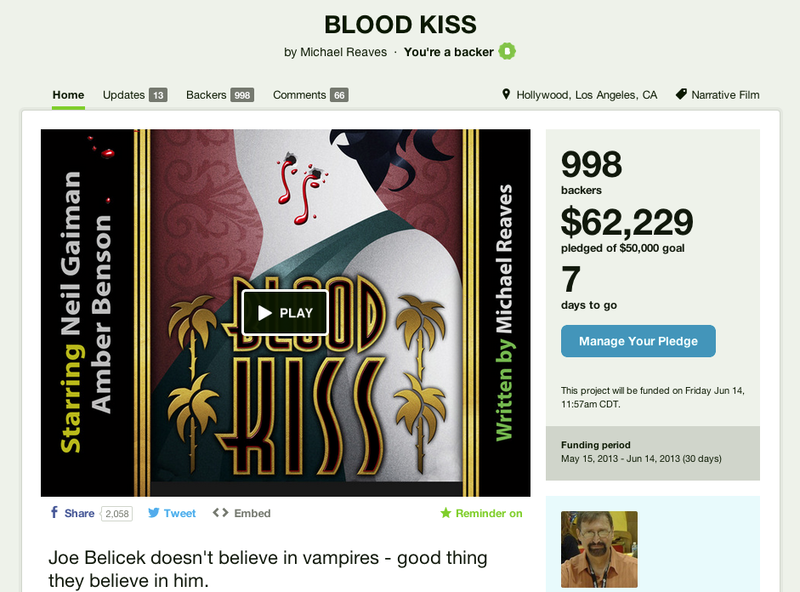 GO PLEDGE TO BLOOD KISS!